The clients had just moved into a house where the main en-suite bedroom had a walk-in-cupboard and partial built-in-cupboards that doubled as a bay window. They wanted to create continuity between the bedroom and the bathroom, which was the feature they most loved about the home. 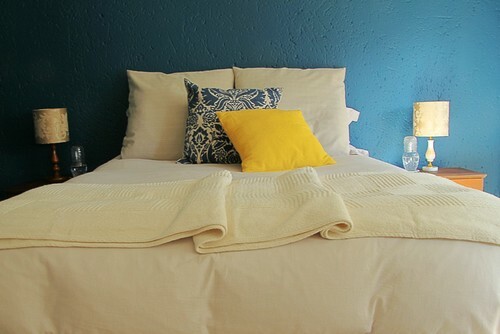 In this case, we assisted them with a theme inspired by their blue bathroom floor. A Moroccan theme was decided on, but it also had to remain simplistic and spacious. Elements such as blue, mosaic, weave, velvet, tassels and Damask were taken and incorporated into a more contemporary environment. The night-sky blue was carefully chosen to compliment the blue in the occasional chairs and the bathroom floor. The grey grouting on the bathroom floor grey was taken and incorporated in the bay window and towels to add a contemporary touch. A simplistic grey paisley was chosen for the window cushion, which formed a subtle comfort on the make-shift daybed, while picking up on the luxuriously textured roman blinds. White synthetic weave baskets look modern and crisp. They're easy to clean and were also used in the bathroom to stack and store towels and toiletries. Damask patterns in gold, off-white and blue unite different elements.